The largest city of French Riviera, Nice is indeed one of the beautiful cities of Europe, which has inspired artists. This classy city on the Mediterranean coast is the perfect holiday destination if you want to enjoy the culture and beauty of a European city with no overwhelming crowd and bustle. 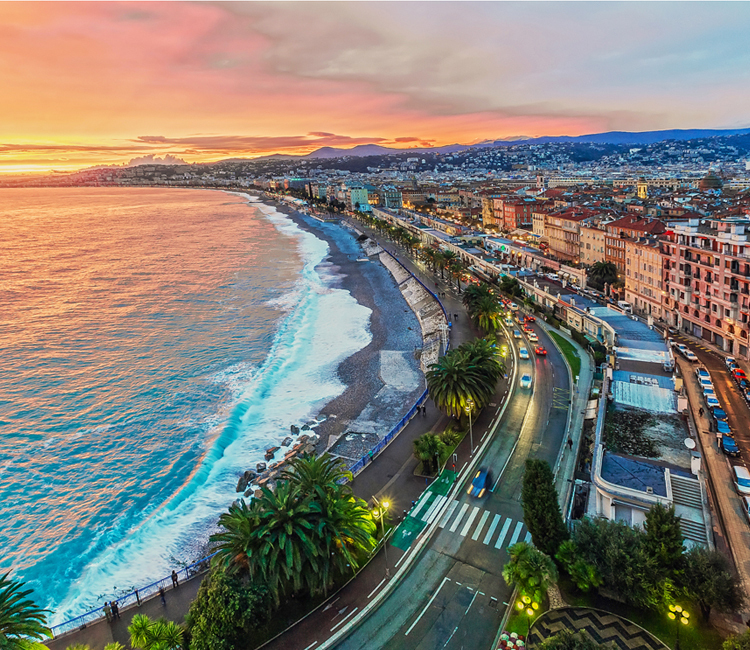 The seaside scenery of Nice makes it even more desirable and picturesque, enough to mesmerize the travellers coming here from across the world. So, book your France Visa appointment by paying the France Visa Fees and visit this beautiful city with wonderful beaches, art galleries, museums and an amazing nightlife too. The top most tourist attraction in Nice is boulevard running by the seaside – Promenade Des Anglais. This famous Oceanside promenade is very popular and is around 7 Km long with a long walkway where you would find people walking and strolling by the seaside observing the beauty, which this city has to offer. You will also find people jogging, running, skating, rollerblading and cycling in the dedicated lanes here and if you wish to enjoy this arresting view in a similar fashion, just hire a bike or rent the skates. Don’t forget to visit the very popular Hotel Negresco (listed as National Historical Monument) for a drink located here in Promenade Des Anglais for its glass roof and the breathtakingly arresting Baccarat 16,309 crystal chandelier in the Royal Lounge. Right next to Hotel Negresco is Musee Massena (a museum) inside a beautiful and lush Villa with its stunning green gardens. This museum displays some very engaging artefacts, displays and art works relating to Napoleon, jewellery that was worn by his Empress Josephine along with personal effects and antiques pertaining to Massena Family that built this Villa. If you are visiting Nice, don’t miss the old town of this city with cobblestone streets and narrow alleyways full of restaurants, cafes, Crêperies, bars and much more. The massive market place Cours Saleya has a flower market, fish market and you can also get almost all the ingredients and fresh produce, you would require to cook a Mediterranean meal. Don’t forget to have Socca (a very delectable chickpea crepe) here at the old town for its one of the most amazing thing you can have along with a coffee. If you are in old town, make sure to visit Nice Cathedral that is quite popular for its prepossessing architecture and Palais Lascaris (a museum in Nice housed in a mansion built in 17th century). Yet another beautiful location to spend a day is the castle hill i.e. Colline du Chateau from where you can enjoy the amazing panorama of the city by climbing the stairs. For an incredible picnic with your family, head towards Parc de la Colline du Chateau (a park where you will find lush green surroundings and a waterfall) during daytime and you would love the setting of this place atop the hill. Apart from these, visit remarkable museums of Nice like Musée Matisse (an art museum), Museum of modern and contemporary art, Musée Chagall (featuring works by Marc Chagall) and many more. Last but not the least, you can take up the bike tour of this tranquil yet beautiful city and also if you seek thrill, head for cliff jumping. Just stroll around the city, enjoy the wine and explore the culture to make the most of your trip to Nice.